Unnecessary growth of cells when body don’t require them is known as cancer. A brain tumour occurs when abnormal cells produce within any part of brain. There are two main types of tumours namely, malignant and benign tumours. • Brain tumour can occur at any age. • The exact cause of brain tumour is not clear. 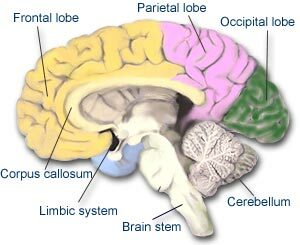 • The symptoms of brain tumour depend on their size, type, and location. • The most common type of primary brain tumour among adults are astrocytoma, meningioma, and oligodendroglioma. • The most common type of primary brain tumours in children are medulloblastoma, grade I or II astrocytoma, (or glioma) ependymoma, and brain stem glioma. • Family history and high dose X-rays are risk factors for brain tumour. • Brain tumours are diagnosed by the doctor based on the results of a medical history and physical examination and various specialized tests of the brain and nervous system. • Options for brain tumour treatment include surgery, radiation therapy, and chemotherapy or a combination of treatments . The brain tumours may produce symptoms that vary depending on the part of the brain they begin. Some common symptoms are headaches, seizures, problem with vision, vomiting, and mental changes. Patient may feel headache and vomiting in the morning. More specific problems may include difficulty in walking, speaking and sensation. What are the available treatments for Brain tumour? Doctors may suggest following treatments according to their type, grade, and position of tumour and general health of patient.